It's true! If you look over to the right, you'll see a button to donate to KB. The author of KB that is. Which is me, incompetent college student Mary Cagle! It'll let you put any amount in, but a dollar is just fine! Once the transaction is complete, it'll take you to a page containing the wallpaper and metaphorical hugs. I've never asked for donations until now, for a couple reasons. 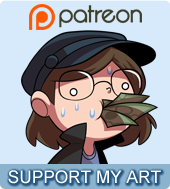 One is that I was worried I couldn't offer anything worth a dollar (which is kinda silly I know! It's only a dollar, Cube! ), and the other is my constant fear that I'll put work out there that nobody will be interested in. I gotta say, that fear stifles a lot of initiatives on my part! But you guys have been super supportive of the comic with the books and just your comments in general, and I can't tell you how much it means to me. I honestly was incredibly relieved when so many of you preordered Volume 1! I really earnestly hope that I can make my living at this someday, and you guys are helping me inch my way towards that goal! So whether you donate or not, I love ya to bits. C'mere so I can give you a big ol' hug!